Viking warriors storm into the torch-lit camp of a rival clan. Outnumbered, the ambushed Norsemen are far from their boats. Their one goal: flee to a nearby castle while keeping their king alive. At first glance, Hnefatafl (prounounced “nef-ah-tah-fel”) might just look like a knock-off version of chess with Norse helms and impressive beards, but the game is at least 600 years older—already well-known by 400 A.D.—and is perhaps a lot more relevant to the conflicts of the 21st century. The game is similar to chess, but with several important differences. 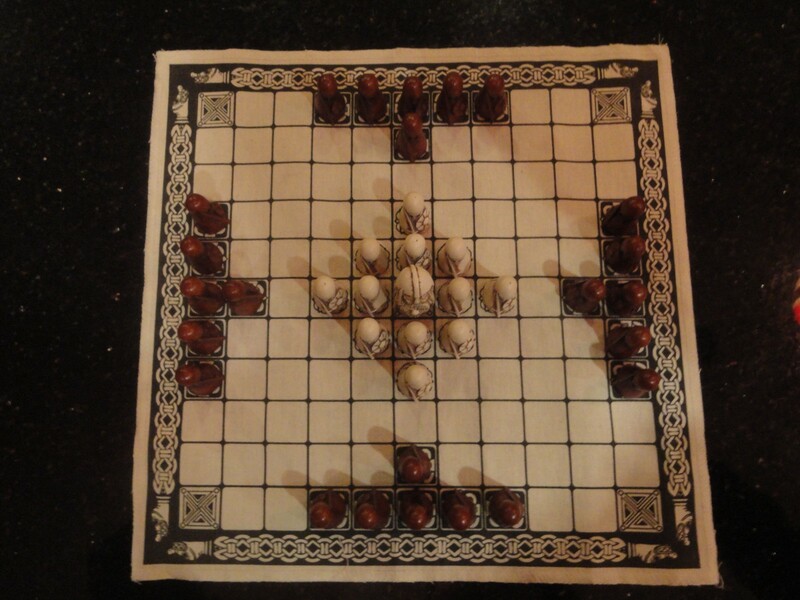 Instead of two identical and equal opponents facing each other, Hnefatafl is a game where one side is surrounded and outnumbered—like a Viking war party caught in an ambush. The game might seem unbalanced. The attacking black player has 24 total pieces—known as “hunns”—to white’s meager and surrounded 12 hunns. But white has several advantages. White has an additional unique unit, a king, which must be surrounded on four horizontal sides to be captured. Hunns require being surrounded on two sides, and that’s pretty hard by itself. White’s goal is also simple: move the king to one of four corner squares known as “castles.” Black’s goal is to stop them. Other rules? All pieces move like chess rooks. Black makes the first move. Black cannot occupy a castle, which would end the game in short order. But black can block off several castles by moving quickly, forming the equivalent of a medieval shield wall. If lines are solid, they have to be flanked. Thus, it’s in black’s interest to force a symmetrical battle to force a likely win. If white can avoid engaging in a battle on black’s terms, then white’s chances of winning improve. This was especially true at the time period this game was played, when battles were largely skirmishes and sieges, and before heavy cavalry arrived on the scene. Two warring sides would sit opposite each other, hacking away until the loser was either exhausted or flanked. That’s how, Wheaton notes, the game gives insight for generals, diplomats and spies tasked with fighting, besting—or at least—understanding what an enemy or rival thinks. Hnefatafl is a Viking’s worst case scenario: Outnumbered, cut off from their boats—and on the verge of being massacred. Understanding the game played by Viking war parties on the way to raid England of its booty meant understanding something about the way the Vikings saw themselves. The total time spent playing the game may have been more than any individual warrior spent sacking the Anglo-Saxons, for instance. “I think the games cultures play can help intelligence professionals understand something about the way cultures think about strategy. Much of the language of strategy gets re-cast as the language of the game,” Wheaton adds. More than that, understanding the games people play might help you learn more about how they operate. Maybe Wheaton is overthinking it … or maybe not. “[Barack Obama’s] got the personality of a sniper,” journalist Michael Lewis said after watching one of Obama’s pick-up basketball games for a Vanity Fair profile. A commentary on drones, perhaps? George W. Bush used his co-ownership of the Texas Rangers baseball team to boost his business credentials during his first presidential campaign. And what about Vladimir Putin? He has a black belt in judo.